The world-first ultrasonic pulse velocity testing instrument for couplant-free on-site quality assessment of concrete structures with up to 2 meters thru-transmission capability. 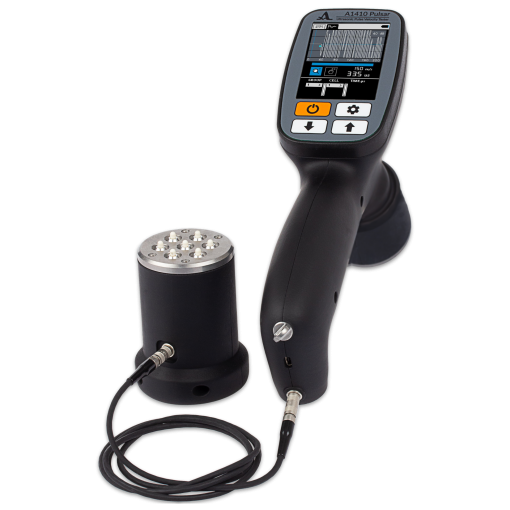 A compact, ergonomic and easy to handheld ultrasonic pulse velocity tester for quality assessment of concrete compliant with valid international standards. The instrument is made of light-weight shockproof plastic and operates two dry-point-contact transducer arrays for through-transmitting up to 2 meters of concrete. Wear resistant wearproof ceramic tips of the transducers are insensitive to the surface condition and allow comfortable and robust operation on site by arbitrary surface condition. Hence, there is no need to apply coupling gel to prepare object surface for testing. The device possesses non-volatile memory allowing storing of 50.000 measurements (the results can be grouped) and USB port for transferring measured data to the external PC. The instrument is suitable for compressive strength evaluation of concrete. The evaluation is based on correlation of longitudinal ultrasonic wave velocity in concrete with its mechanical properties. Measurements are performed by thru-transmission of inspection object by means of two transducer arrays. •	Evaluation of the load-carrying ability of concrete backbones and posts. •	Evaluation of porosity and fissuring of concrete. •	Evaluation of anisotropy in composite materials. Overall dimensions of the electronic unit, mm., max. Weight of the electronic unit, gr., max.